Thunder is rumbling outside, and I have sissy-la-la Jinxy shaking in my lap as I write this. All I’m missing is a glass of wine or a cup of tea. Sometimes in your reading life, you almost forget that feeling of becoming so immersed and falling so in love with the characters and the story itself. Of course there have been plenty of good books that I’ve read over the past few years, but reading The Shoemaker’s Wife was an experience that I had been missing without even knowing it. First of all, let me explain that I had never even heard of Adriana Trigiani (what kind of reader am I??) before receiving this book in a book exchange through Facebook last spring or summer. Talk about happy mail! The woman who sent the book to me included a little note: “Enjoy this book. It was wonderful!” but of course, I kept pushing it aside. Finally, I started a “book club” with two friends of mine at the beginning of this summer, and we added The Shoemaker’s Wife to our list. Thank. God. The Shoemaker’s Wife centers around the lives of Enza Ravanelli and Ciro Lazzari, who both grow up in neighboring villages in the mountains of northern Italy at the turn of the century. Ciro and Enza meet briefly when Ciro is sent to dig a grave in Enza’s village, and the two feel an instant connection. They are quickly separated when Ciro is sent to America as an apprentice to a shoemaker; he leaves with no word for Enza, and she knows she must forget about him. Not long after, Enza arrives in America herself, and after some struggle, she finds her calling as a seamstress for the opera singer Enrico Caruso at New York City’s Metropolitan Opera House. Enza’s and Ciro’s paths cross a few times over the years, and despite the feelings they have for each other, their lives keep taking them in different directions. All right, I need to be honest and tell you that there is so much more I could add to that synopsis but I was afraid I would give too much away! Just do yourself a favor and go read this book! This was truly one of my favorite books that I’ve read in a long time, for so many reasons. There was enough conflict, but it never felt forced. I felt so connected to the characters and could so easily picture the mountains of Italy, as well as the shops and streets of New York City in the early twentieth century. And the food! It is a miracle that I didn’t run to the nearest Italian restaurant and stuff my face with delicious pasta dishes and mozzarella cheese every single day while I read this book. Let’s be honest, it’s another miracle that I didn’t jump on a plane with a one-way ticket to Italy. The Shoemaker’s Wife was inspired by Adriana Trigiani’s own family history, and it certainly did feel like I was reading a true-life story of two people who came to America with dreams to help their families back home. This story was such a lovely tribute to those who left their families and all they ever knew at the turn of the century, to go to a brand new place to make a brand new life. This was a beautiful read. As soon as I finished Tiny Little Thing, I jumped right into A Hundred Summers, also by Beatriz Williams. This has also been on my TBR list for a long time, and on the same shopping spree where I bought Tiny Little Thing, I bought A Hundred Summers. This one solidified Williams as a new favorite author. A Hundred Summers takes place in the beach town of Seaview, Rhode Island, in 1938. Lily Dane has summered at Seaview for her entire life, and most of those summers were spent with her best friend growing up, Budgie Byrne. This friendship lasts through their senior year of college, until Budgie betrays Lily and Lily stops contact with her. It has been six years since Budgie and Lily’s friendship ended, and Lily is settling in for another summer at Seaview, when Budgie returns to her family’s beach cottage. She is not alone, though; she is with her new husband, and Lily’s former fiancé, Nick. As the summer goes by, Lily begins to form a new friendship with Budgie and to move on from Nick. It isn’t until the summer begins to draw to a close and the Great New England Hurricane approaches, that Lily learns that things were maybe not quite as they seemed six years ago. 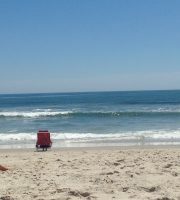 I am so glad that I waited to read this book until I was at the beach! With the setting a small beach town, it was the perfect read as I listened to the waves crash – either in my beach chair in the sand, or an Adirondack chair on the porch of the house my family rents! I felt like I was in Seaview with Lily, and even more fun, like I was back in time, living in the 1930s. One thing my mom commented on as she read it (at my suggestion as soon as I finished it! ), was how she wanted to have the same drinks the characters were drinking throughout the books. The details and descriptions drew me in so completely, so I knew exactly what she meant. Just like Tiny in Tiny Little Thing, I found Lily very easy to relate to and sympathize with. I also was a huge fan of the incorporation of the Great New England Hurricane of 1938 into the storyline, and the historical note included at the end. This is something I would never have known about if I hadn’t read the book, and I was interested to learn more. I always love learning a thing or two while I’m reading a great story! A Hundred Summers was a fantastic book, and I highly recommend it. But if you’re anything like me and would be depressed reading about the beach while you’re land-locked, then definitely save it until you’re on a beach trip! I’m on a Sarah Addison Allen kick! 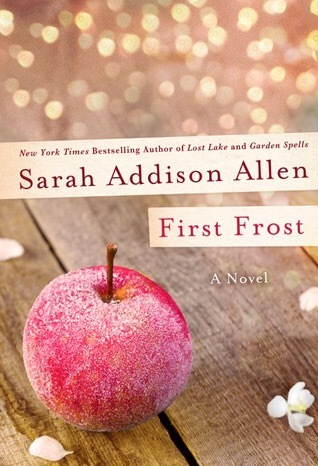 Immediately after finishing First Frost, I pulled The Peach Keeper off my shelf, because I had so enjoyed my first taste of Sarah Addison Allen. The two books I’ve read so far have been the perfect reads for summer – although, First Frost would have been an even better read once fall comes around and I have my cozy decorations up! I’m sure I’ll be able to find something off my TBR pile. The Peach Keeper is set in North Carolina, in a small town called Walls of Water. The story centers around two young women who have lived in Walls of Water their entire lives, and whose families have a history. Despite this, Willa Jackson and Paxton Osgood have no interest in each other. So when Willa gets an invitation to the 75th anniversary gala for the Walls of Water Women’s Society Club, she of course brushes it off. Willa is especially uninterested this year because the gala will be held at the Blue Ridge Madam Inn, an old sprawling mansion built by her great-great grandfather…and being restored as a bed-and-breakfast by Paxton and her high-society family. As renovations and landscaping near their end, a skeleton is uncovered beneath a peach tree in front of the Blue Ridge Madam. The mystery surrounding the body brings Paxton and Willa closer together than they could have predicted, and helps them to discover more about their families’ histories, and themselves. This was a book that I thoroughly enjoyed (I finished it in three days – yay, summer!). I really liked both Willa and Paxton, and was happy to watch their friendship develop. This story had more than friendship, and I loved the romance piece of it, too. I found myself able to connect to the characters, especially Paxton and her relationship with her family. Somewhat similarly to First Frost, I came across several sentences that I especially loved. This story also had just the right amount of magic in it, which is present in all of Allen’s novels (and why I want to keep reading more!). Overall, if I had to compare the two, I may have to place The Peach Keeper slightly above First Frost. My only reason for this would be that I felt more of a connection to these characters, and that could simply be because they were the same age as me and going through similar experiences (kind of…). Off to the library to check out another book or two so I can continue the Sarah Addison Allen binge! Claire Waverley has started a successful new venture, Waverley’s Candies. Though her handcrafted confections-rose to recall lost love, lavender to promote happiness and lemon verbena to soothe throats and minds-are singularly effective, the business of selling them is costing her the everyday joys of her family, and her belief in her own precious gifts. As I mentioned in my previous post, this was the first book I’ve read by Sarah Addison Allen. I’ve had two of her other books on my shelf, but just never felt like they caught my attention. I never realized that First Frost is a sequel to Allen’s first novel, Garden Spells. Still, I didn’t feel that the books had to be read in order, in order to understand what’s going on with First Frost, but I can imagine that it would have been helpful with background on the characters. I certainly plan on reading Garden Spells soon (and the rest of Allen’s novels – I’m hooked!). One thing I especially liked about this novel was that the characters each had their own problem they faced. Those problems somewhat overlapped throughout, but the story line would switch between each character. I’ve noticed that I tend to gravitate towards novels with multiple story lines; I suppose they’re what draw me the most. Besides this, each character seemed realistic, like someone I would know in real life. The descriptions of the setting made Bascom a town I could easily picture myself living in. Something new for me as far as genre goes was the magical realism that is present in Allen’s novels. That aspect could be why I never felt compelled to read her other books I’ve had, though I can’t say why. Obviously, I didn’t know what to expect when it came to the magical realism, but I absolutely loved it! It was just the right amount of magic sprinkled in – I didn’t come away annoyed and rolling my eyes like I had when I suffered through Beautiful Creatures. Quite the opposite! I am itching to read the rest of Allen’s novels; they make a fun escape, but still allow you to use your brain. But perhaps what I liked best of all was the underlying message that came through. I’m sure you can guess from my last post that this book really got me thinking about belonging and finding your place, and my own life. I often found myself wondering how I would feel or what I would do in different characters’ situations. I could easily see this book as a great choice for a book club because of those themes alone. If you’re in a reading slump (or not), I can easily recommend Sarah Addison Allen. You may want to start with Garden Spells before First Frost, but I have a feeling you won’t be disappointed no matter which book of hers you choose. I’m off to the library today to find a couple more (vacation is coming!)! More reviews to come! If you HAVE read any of Sarah Addison Allen’s other books, which one is your favorite? Let me know in the comments! If you haven’t read Delirium yet, wait to read this post. This is the sequel, and it’s impossible to write about it without spoilers. Pandemonium picks up where Delirium left off. Lena has escaped Portland into the Wilds, and is trying to heal – physically and emotionally – and find her place among a group of “Invalids” who have taken her in. Eventually Lena is given an important role in the resistance; she is assigned to watch Julian Fineman, son of the president of the DFA (Delirium-Free America, a group whose purpose is to promote the Cure). This assignment takes Lena, as well as a number of her friends from the Wilds, into the middle of a DFA rally in Times Square. When an attack happens at the rally, Julian is taken into an old subway tunnel. Lena follows, and soon finds herself fighting for her life. Overall, if you loved Delirium, it’s a good idea to read Pandemonium. And pick up Requiem while you’re at it, trust me.